Ick, it’s Cyber Monday and I have to spend my computer time catching up on this! Oh right, plus there is laundry to do. 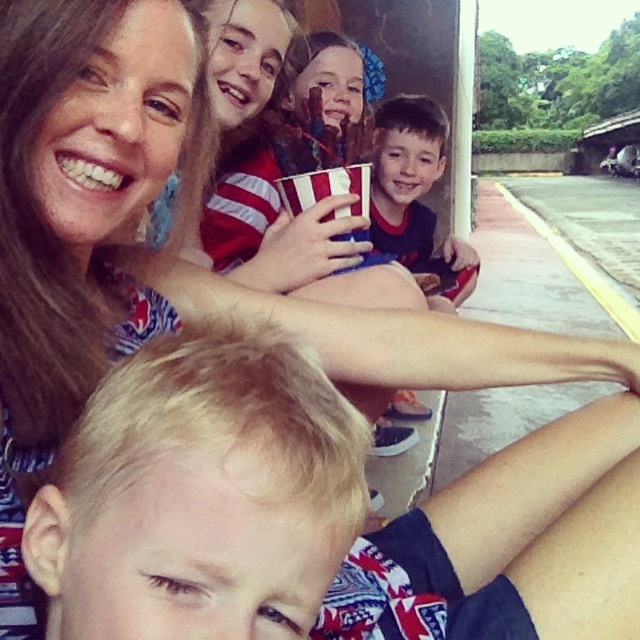 I’m about 10 posts behind so, as only a mom of five can do, I’m going to multi-task and roll it all into one post, check out the cyber-sales while the photos upload, and perhaps fold the laundry with my feet while my fingers furiously dance over the keyboard. Rewind back to November 11, which is Bella’s birthday! When she is in the US, she gets the day off school AND a parade, with many thanks to our brave veterans who have sacrificed for our freedom! We started the day with the largest Veteran’s Day Parade in KS! It was a gorgeous day and the kids loved the fun parade. I felt like I was in Radiator Springs. After the parade, we picked up Popeyes, which was Bella’s birthday choice. We enjoyed a quick lunch with Josh’s parents, celebrated with a Junior Mint cake, and gave Bella some presents, which included gymnastics lessons! She’s super excited, as am I. After that party, we headed to AR to celebrate with cousins! They just moved into their beautiful new home and we were thrilled to be their houseguest! Not only was it a super fun weekend, but it was also so relaxing! The kids played outside all morning, so us big kids played Settlers of Catan. They made our visit extra special by making Bella a cake and giving her Pie Face and cozy slippers. The kids had stomach aches from laughing so hard while they placed Pie Face. We also ate an insane-but-not-surprising delicious meal by Joe. When we returned from AR, we jumped into more fall activities, even though it was in the 70’s! On the weekend, Josh built a fire out at the fort and they all roasted hot dogs for lunch. It was one of those beautiful days where its cold, but not windy, so very fun to run around in. No, I didn’t run that day. What a waste. At the end of the week, we all got to go to Seussical: The Musical at the high school. My mother-in-law played the keyboard for the performance, so it was extra fun to see it. Faith Academy did the same show a few months prior, so Mackenzie and I kept whispering to each other our thought, comparisons, and contrasts. The next day, our AR cousins came to visit and to watch the show. I sat with the second batch of kids, just to make sure they behaved and didn’t start marching around the theater to I Do Not Like Green Eggs and Ham! After two days of school, it was time for Thanksgiving! It’s super special to be in the US for this holiday, as we don’t celebrate it in the PI. It’s so fun to pack up and hit the road, knowing that on the other side, family, food, and fun is waiting! We drove up to my sisters house for Thanksgiving. I finally convinced Josh to listen to Hamilton on the way up, and now he wants to go see it! I ran my first Turkey Trot with my Heather, Mackenzie, and my little niece, Isla! After bagels and apple cider at the Trot, we headed home by 10am. By noon, my sister had an amazing Thanksgiving feast on the table! It helps that she made a career of cooking for the masses for a long time. I made a sweet potato casserole and I was also in charge of weaving some bacon around our family fave- brussel sprouts. Genius. Since we ate at noon, I had time for a nap, and still had time to go shopping! Heather and I hit some sales together. It was so much fun to hang out together, and talk each other and and out of buying. We were in a long line at Kohls, so we had to facetime my mom. We were, after all, in her kingdom. That night, my sister and I HAD to check out the new Anne of Green Gables on PBS. It was cute, but doesn’t even come close to the original! We went to sleep dreaming of the new Gilmore Girls on Netflix! As soon as we woke up, we got our coffee and settled in for an entire day of binge watching. It was glorious! We kept having to pause it to deal with one kid or another, so around lunchtime, Josh took ALL the kids out to McDonalds and the mall. He’s such a great dad! Heather and I had so much fun aww-ing and squealing when one of our favorite old characters would pop up on the screen. We decided of the two marathons we’ve now done together, the Gilmore Girls one was way better than the Chicago one. AND we got to cross the finish line holding hands in this one. Another great dad, Uncle Bryan won all of the kids love when he pulled out ice cream cones in between meals. The next day, we had to trek back home. We left nice and early in order to be back in time for another Thanksgiving dinner at the homestead. It was amazing, and it was miraculous that we got everyone at the table, as well as all the food! I didn’t take any pics unfortunately, but it was just a teaser for the hoopla that is to come at Christmas time! …which is probably when my next post will be. A selfie while we waited for Daddy and Sim. 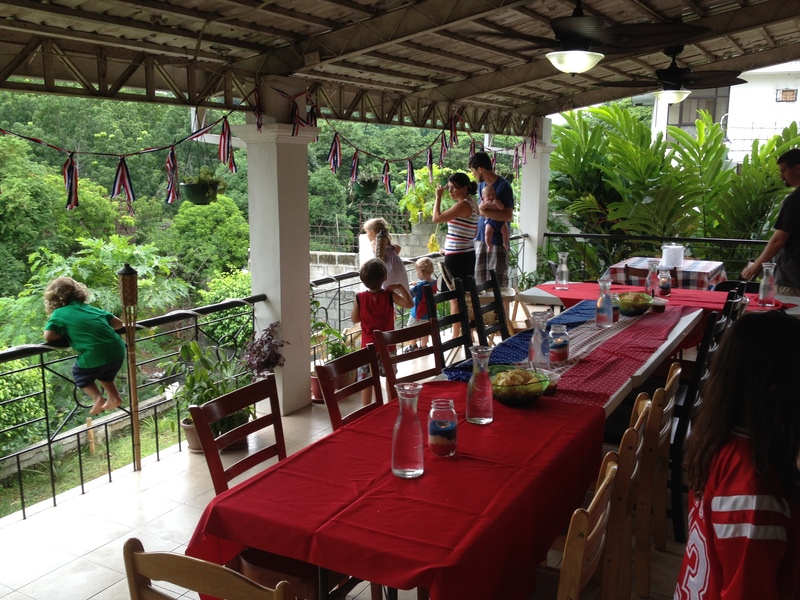 Our friends have a beautiful big covered porch that is perfect for entertaining! It overlooks a river and tons of other scenery. They also have pineapples growing in their yard! 18 months until they are ready to harvest!!! They even made a blob for the kids! 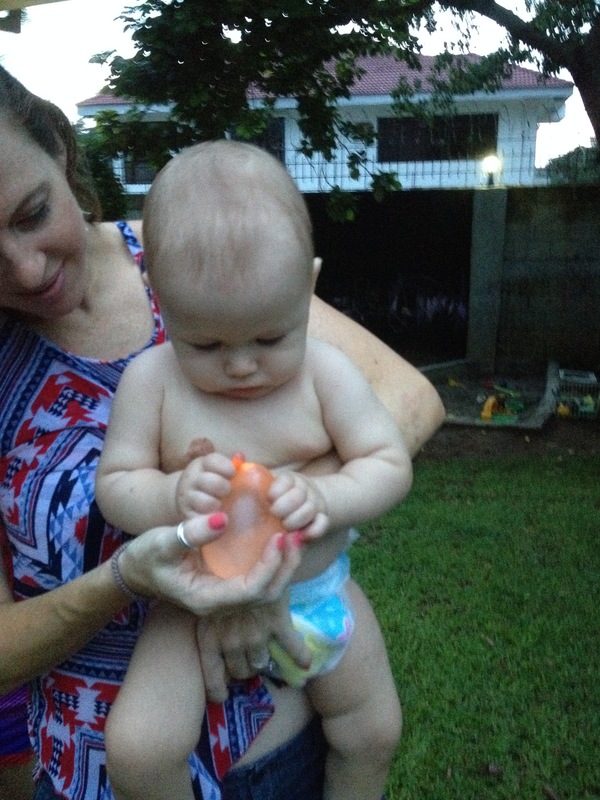 We gave Simmy a water balloon, sure that he would bite it and water would explode all over him (and me!) But he wasn’t ever able to puncture it. He tried! 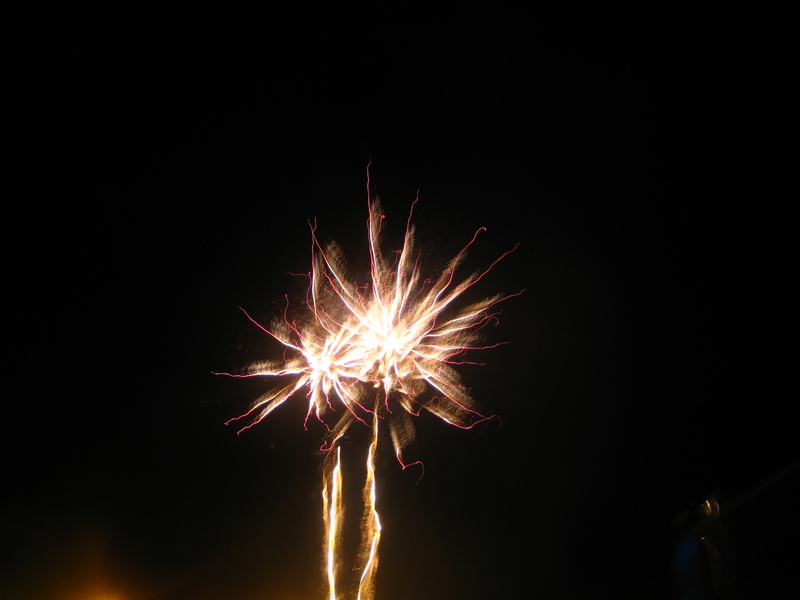 When it got dark, we lit some sparklers and some fireworks. The kids loved it! While I normally don’t like how it gets dark every night between 6:00-6:30 all year, I do like not having to wait until 9:30-10:00 for fireworks! 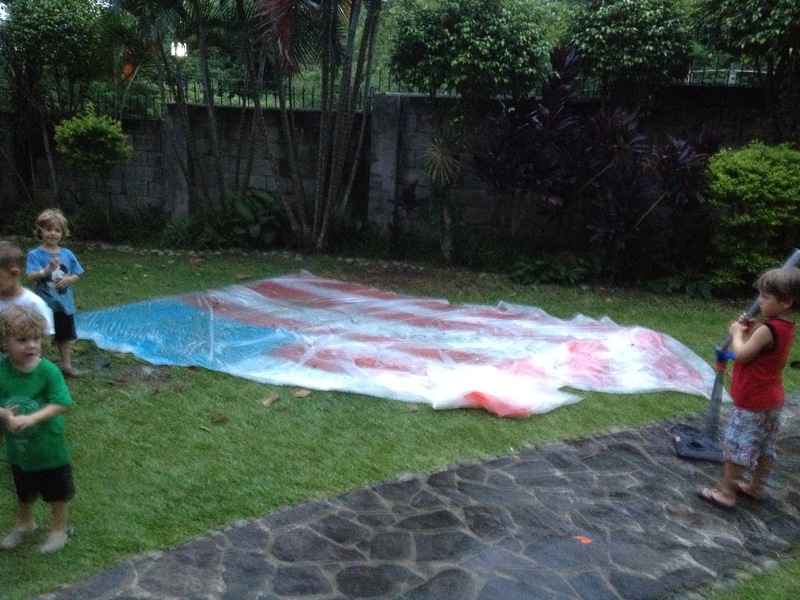 It’s exciting to realize that our next 4th of July will probably be in the good ol’ USofA! My Mom2Mom group hosted a Trunk or Treat on the elementary playground this year. It was so fun to see so many adorable tiny humans in costume! There is a store here that always has random items for cheap (I scored a $100+ Ninja set for less than $50!) Anyway, the last time we went, they had Halloween costumes from Kmart for $5-$10, so my mom and dad outfitted the kids in their costume of choice. 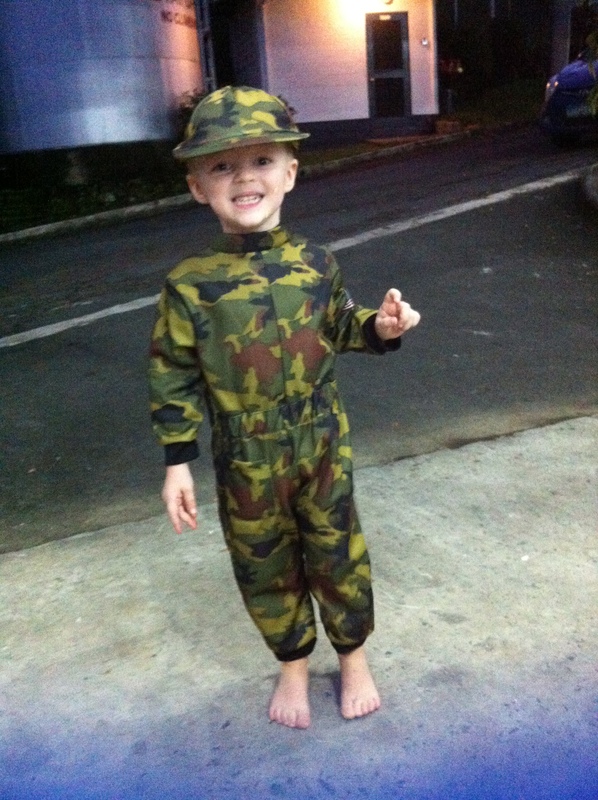 Caleb was an army man. 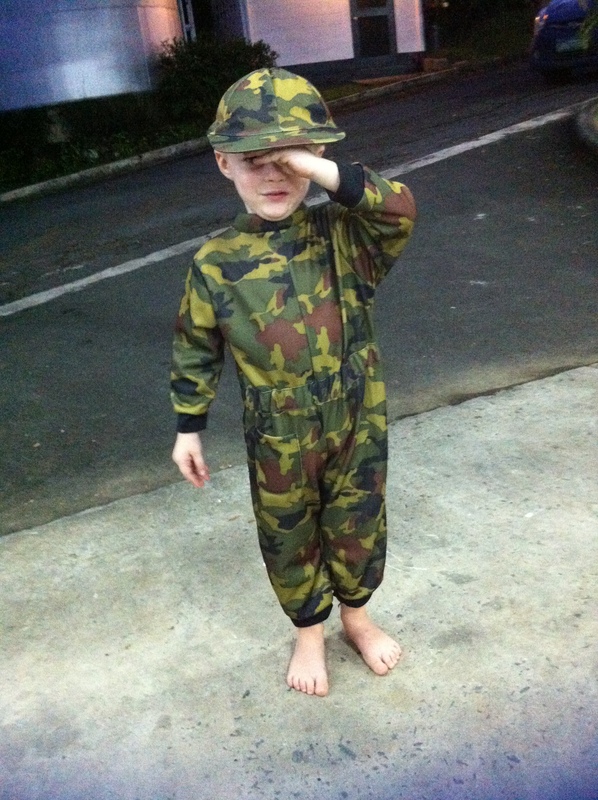 This is what he did when I told him to salute. Deacon chose a Power Ranger. 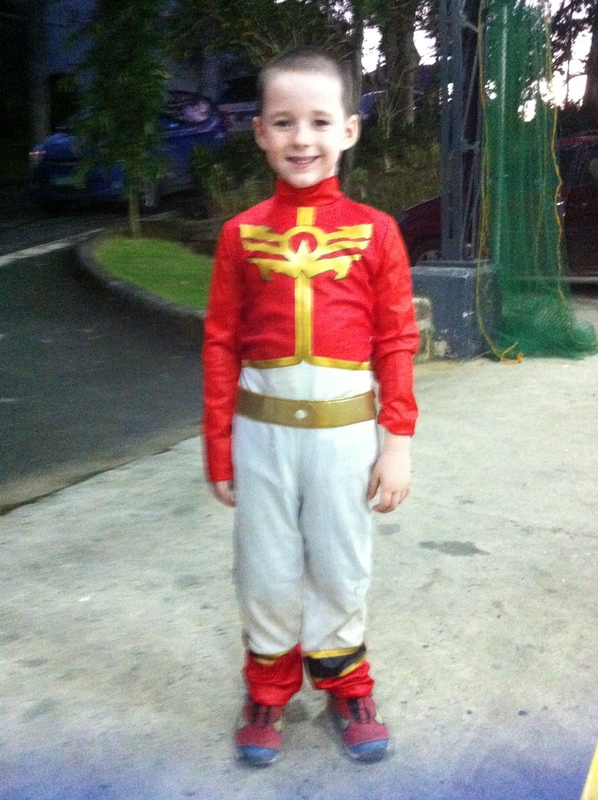 He’s never seen the show, but it was the most super-hero-ish of the costumes that he could find. Bella is a pirate princess, but she is at a sleepover birthday party, so she didn’t get to join us, but she still took the dress with her. 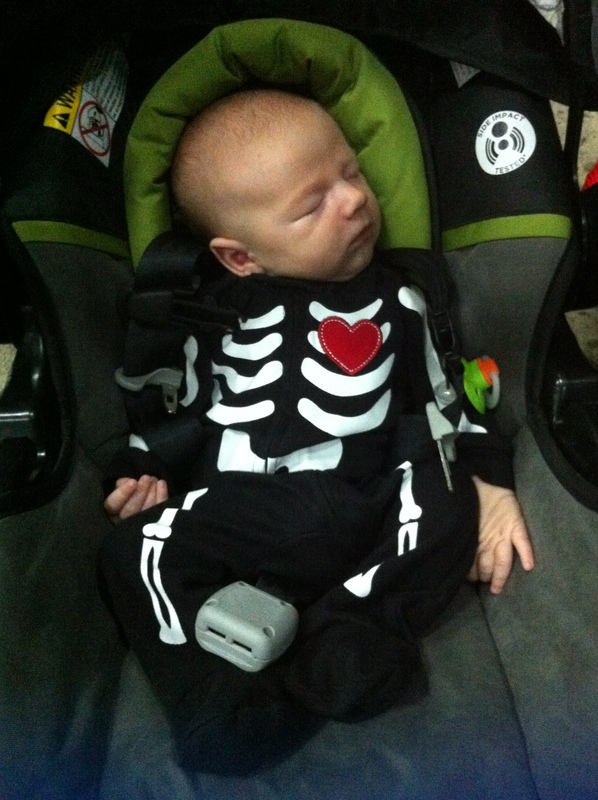 Little Sim is the cutest little skeleton with a big ol’ heart. 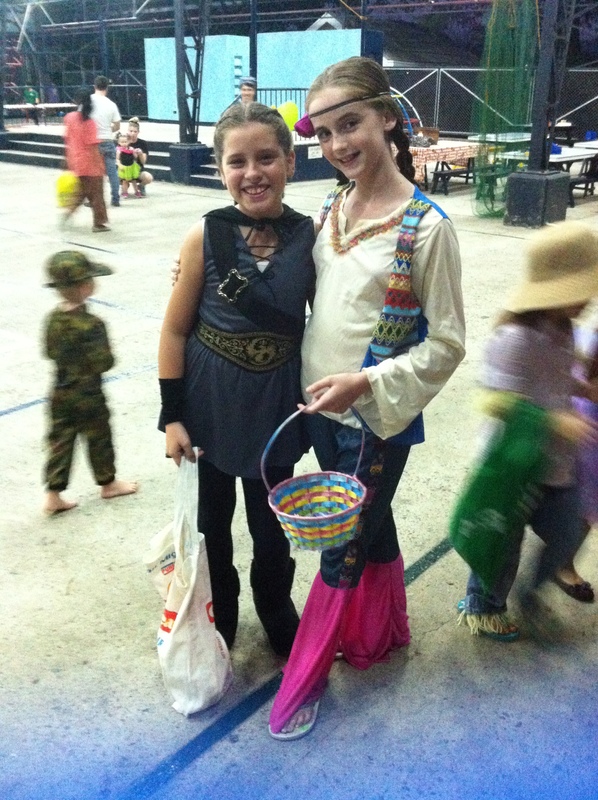 Mackenzie chose a 70’s costume. I’m already planting the seed for her to dress up as American Girl Julie for Literacy Day in May! 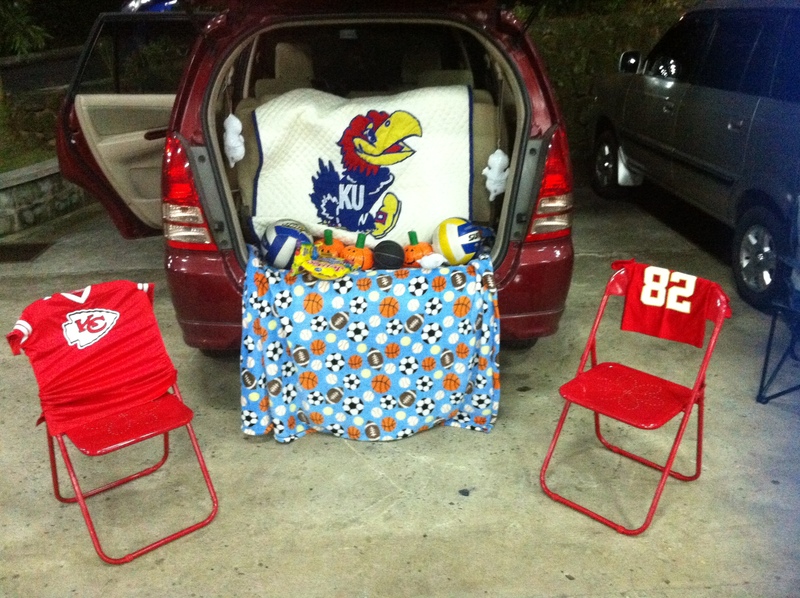 Our trunk was Kansas sports themed — really stretching our creativity. 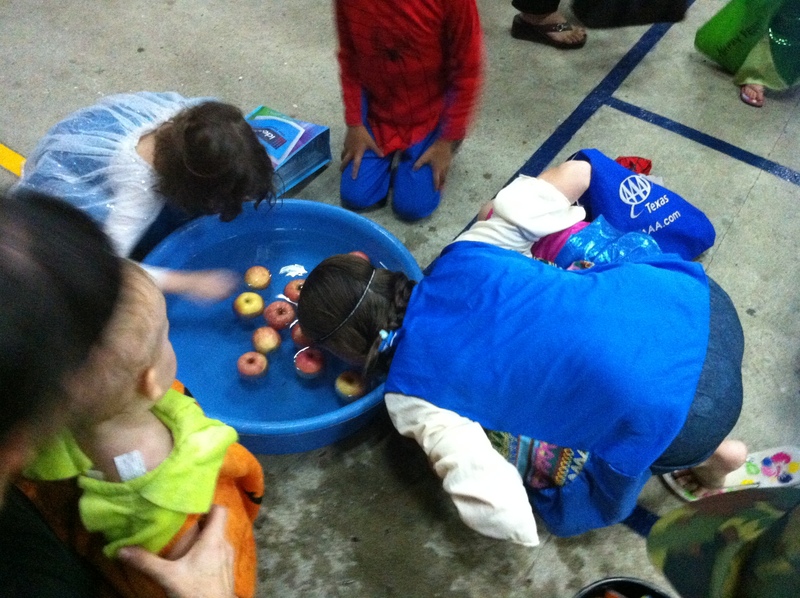 Mackenzie played a Halloween classic – bobbing for apples! 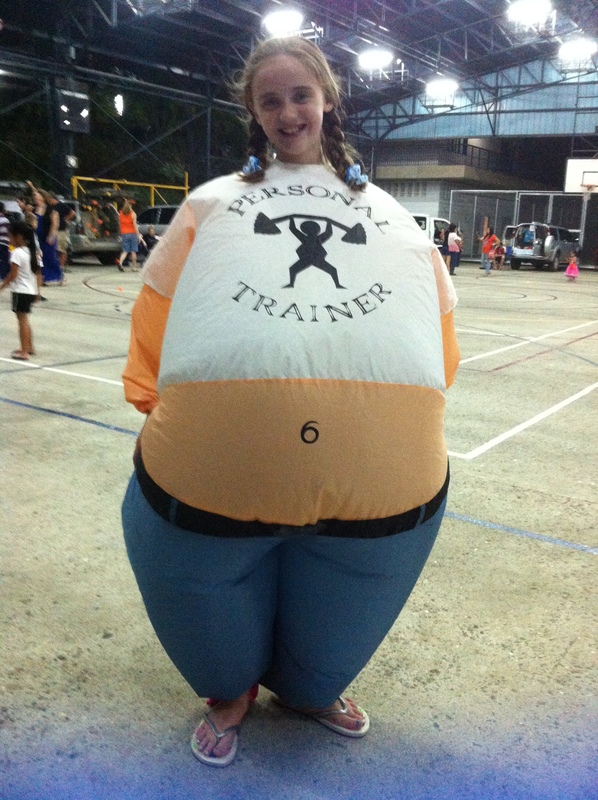 She borrowed our car-neighbors fat trainer costume for a few laughs. The kids came home with a great selection of candy, and aside from some M&M’s, Snickers, and Nerds, I’m not so tempted by it! The local candy isn’t so great, so I don’t find myself sneaking into the kids stash in the middle of the night. * Josh wakes up before me. * He helps the kids make my favorite breakfast. * I’m not really sure what all goes on after that because I’m tucked away in bed while the house gets cleaned and when it’s time to leave for church, everyone is ready to go! * I get to be queen for the day! 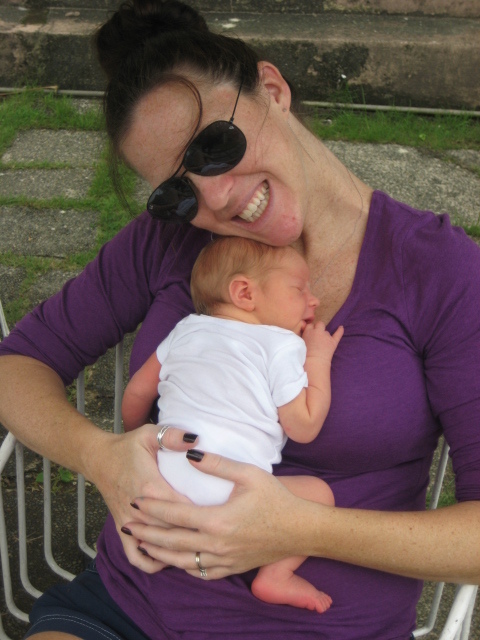 Each Mother’s Day has been better than the last! 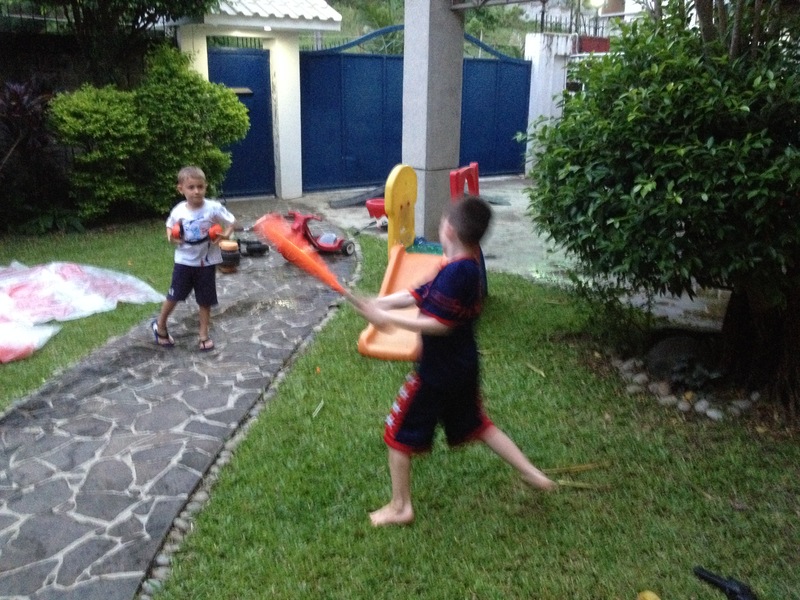 As the kids get older, their notes, actions, and attitudes are priceless. 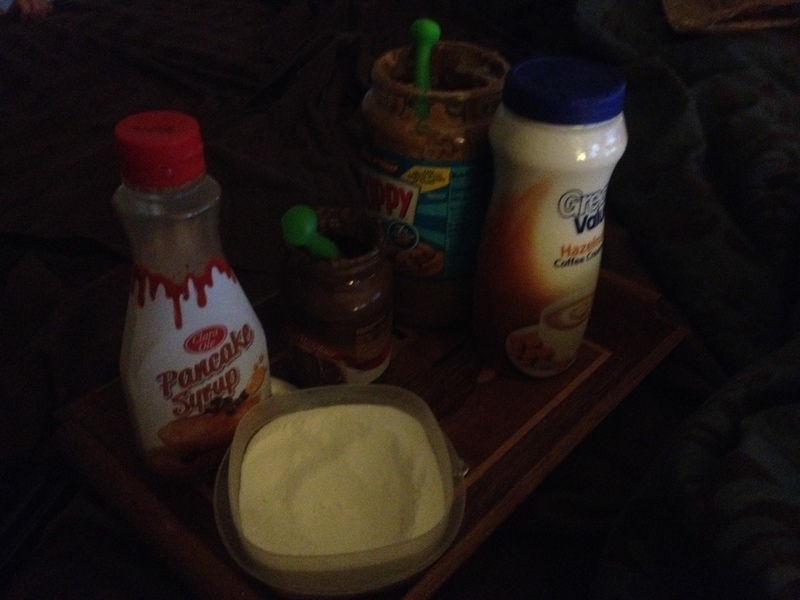 I woke up to a fantastic breakfast brought to me by three huge grins (Caleb was still asleep). 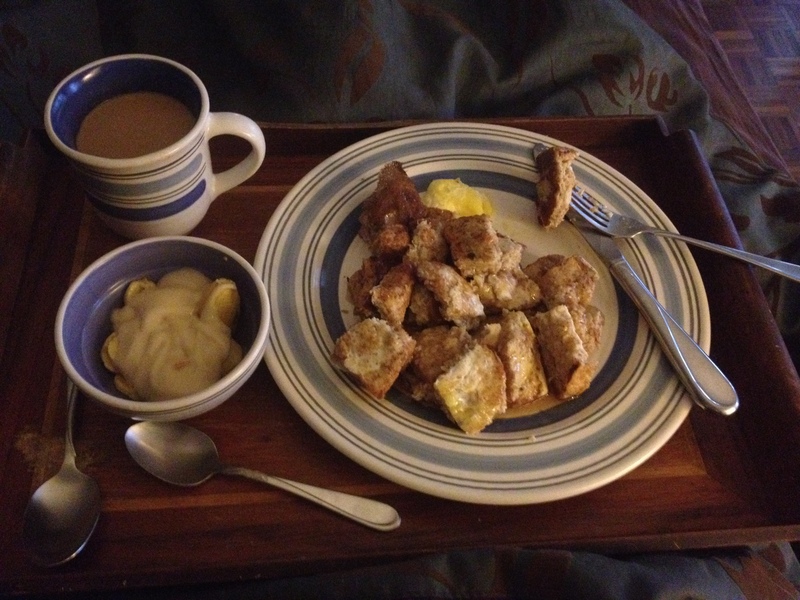 French toast, bananas with custard, and coffee. True to Josh’s form, I was also brought a tray of just condiments! The kids each gave me a gift with a card. The stuffed pig is from Bella, and he has a little slit in his back meant to hold my cellphone. It’s really cute! I’m all about those Starbucks iced coffees these days, so Deacon indulged me! I wish they were cheaper, but they are definitely my treat each day. 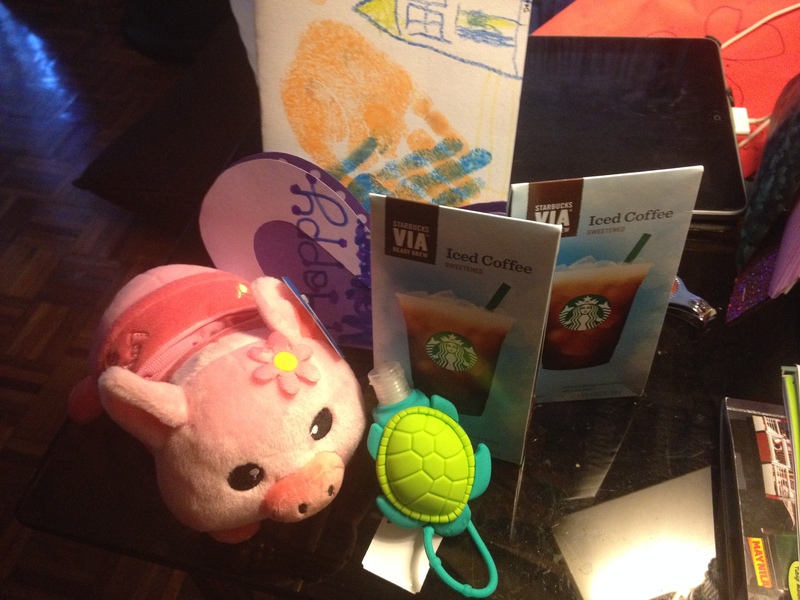 Mackenzie gave me that turtle that doubles as hand sanitizer. Caleb gave me a thermal mug, and He-Who-Is-Yet-To-Be-Named gave me a few outfits from Carters.com. Thoughtful little peanuts! 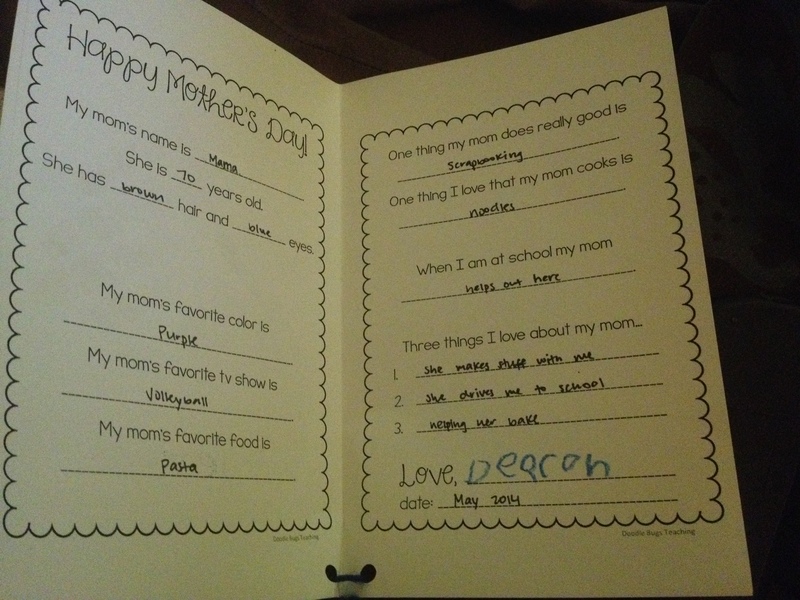 There is nothing better than Mother’s Day cards from preschoolers! My mom’s name is Mama. She has brown hair and blue eyes. My mom’s favorite color is purple. One thing my mom does really good is Scrapbooking. Three things I love about my mom… 1) She makes stuff with me. 2) She drives me to school. 3) helping her bake. Bella also had heartfelt sentiments on her card. -You are kind to me. I have to get a file to save all of these precious Mother’s Day cards! I love them and the little hearts that made them. Aside from the triple digit “feels like,” we had a terrific Easter! I wouldn’t be surprised if some people got saved today simply because scripture says that hell is way worse than suffering a 100 degree day! Thankfully, Josh drives like a maniac in this anything-goes driving culture, so he got us to church just a few minutes late. It was a terrific service, and of course, overly emotional for a pregnant girl like me. The enormity of the sacrifice that Jesus made for me sinks in just a little bit more each year of my life and at the same time, the ability to say thank-you enough seems even more impossible each year! 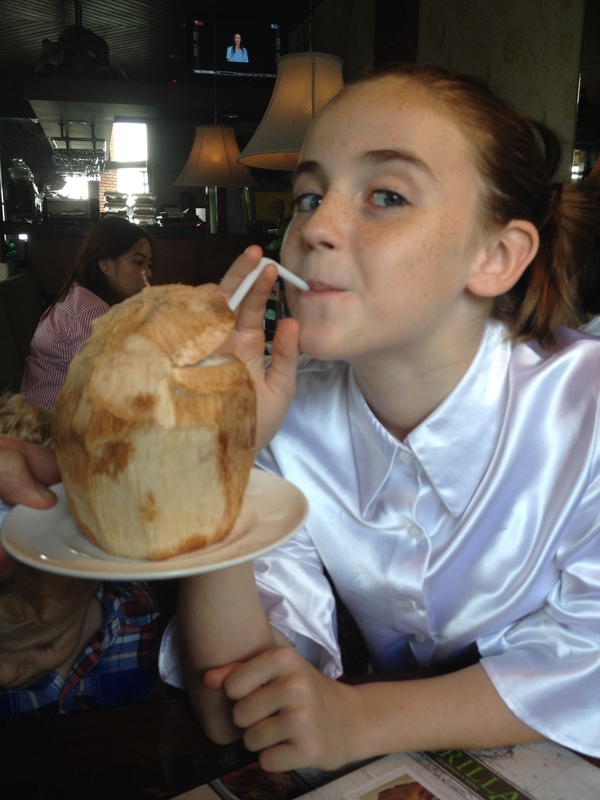 After church, we ate at a nearby restaurant that we rarely go to, but figured wouldn’t be too busy on Easter. 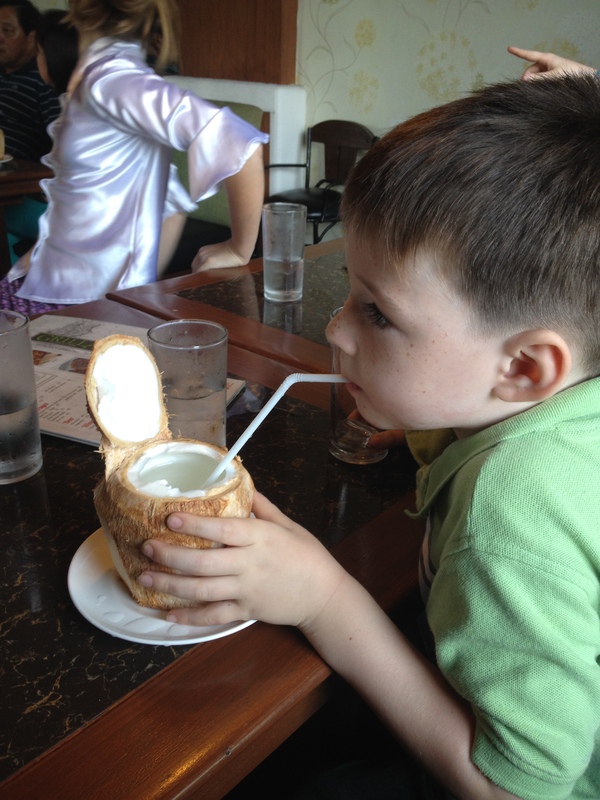 We ordered a buko juice to share. I’m not a big fan, but Josh said that it was spectacular. Caleb wasn’t a fan either. He literally just let it run out of his mouth as soon as it went in! 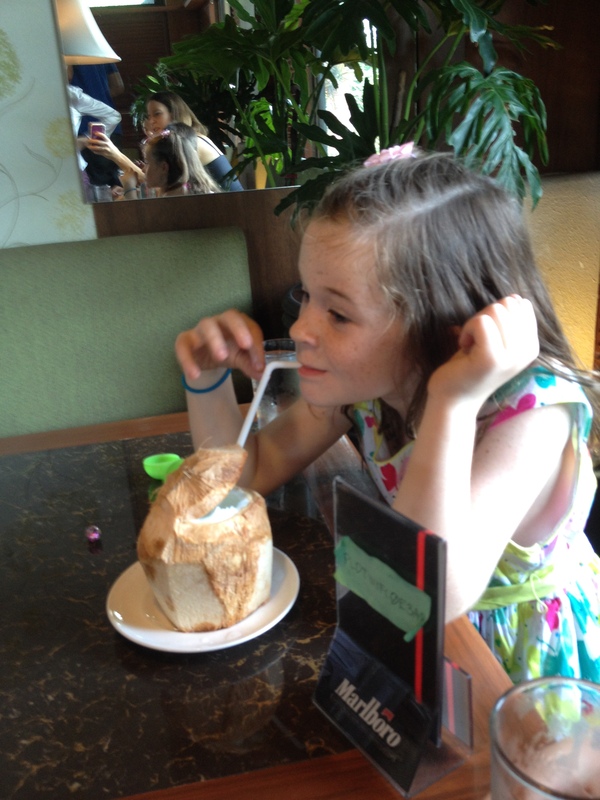 The other kids loved it, and especially loved scraping off the buko meat. We ran into some friends at the restaurant and they made it an extra-special day for us. When it was time to pay our bill, the waitress informed us that they had picked up our check on their way out of the restaurant! So sweet and such a blessing to us! 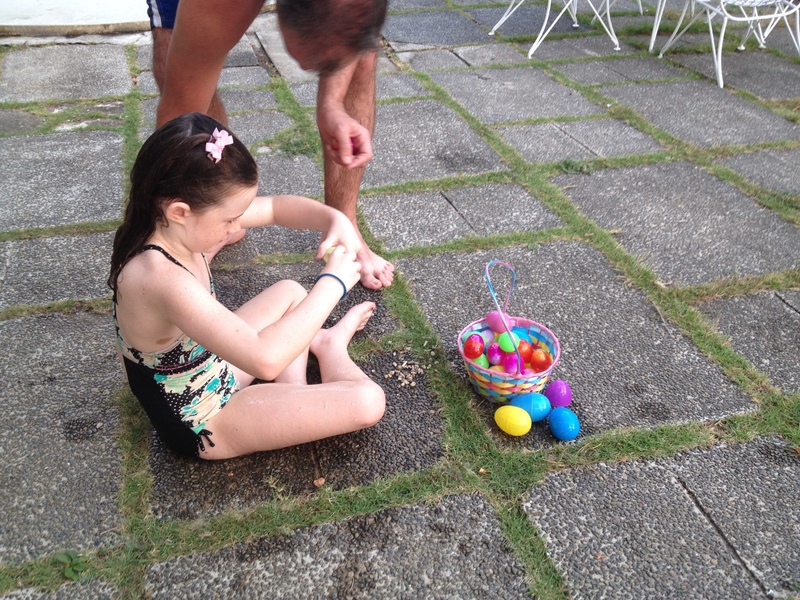 After our mandatory naps, it was time for an egg hunt. 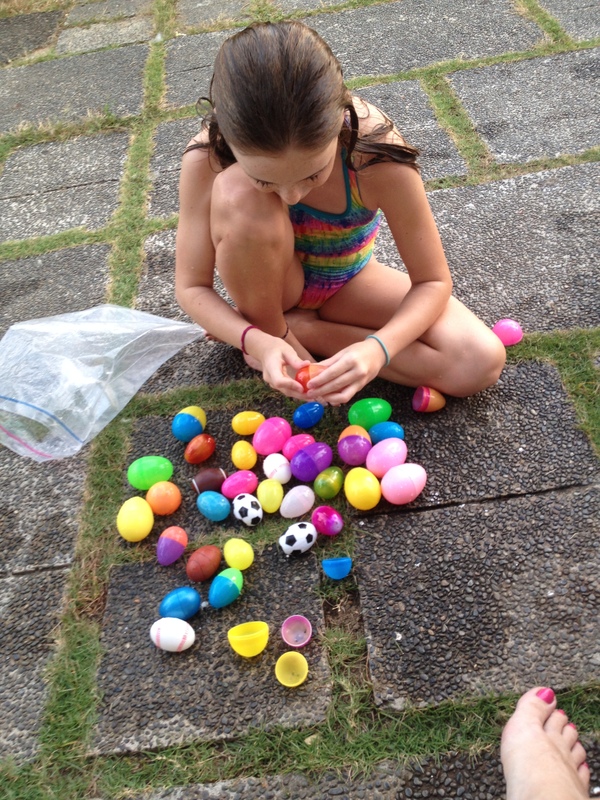 We decided to beat the heat by changing up the Easter egg hunt a bit. 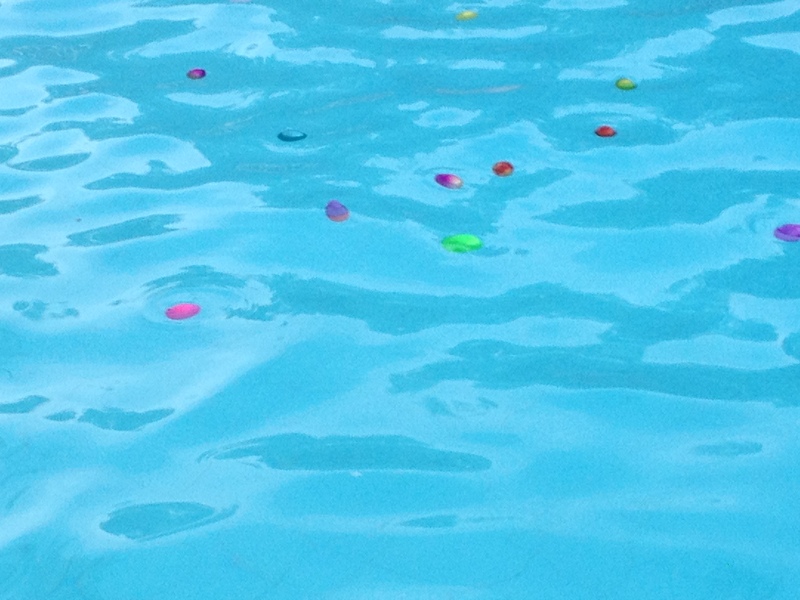 We threw all the eggs in the pool. 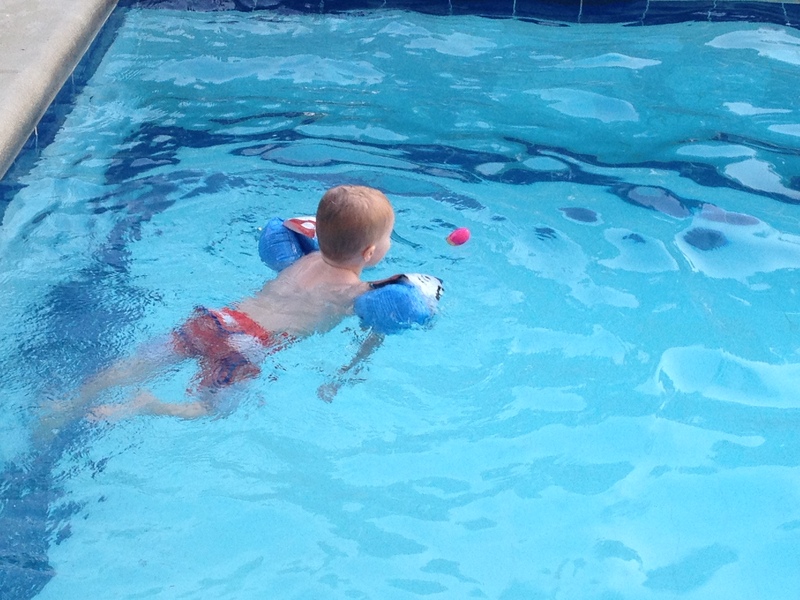 Some of them floated and some of them sank, so there were plenty for each of the kids to dive for. Obviously, we didn’t put candy in the eggs, but we gave out some prizes at the end. 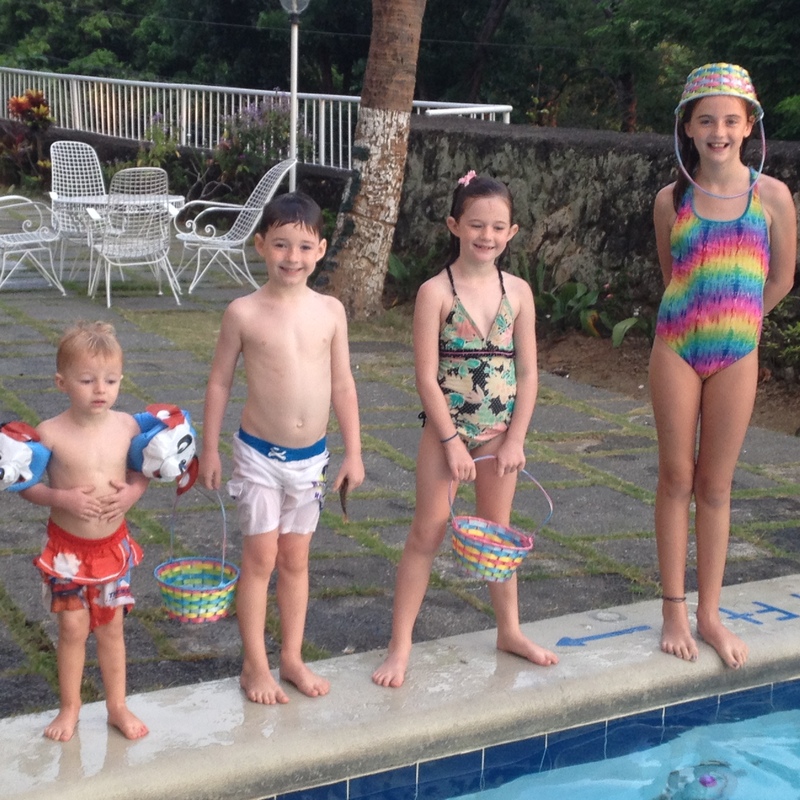 Bella collected the most eggs, but Mackenzie got the most “points” because she dove for the one’s that sank to the bottom. 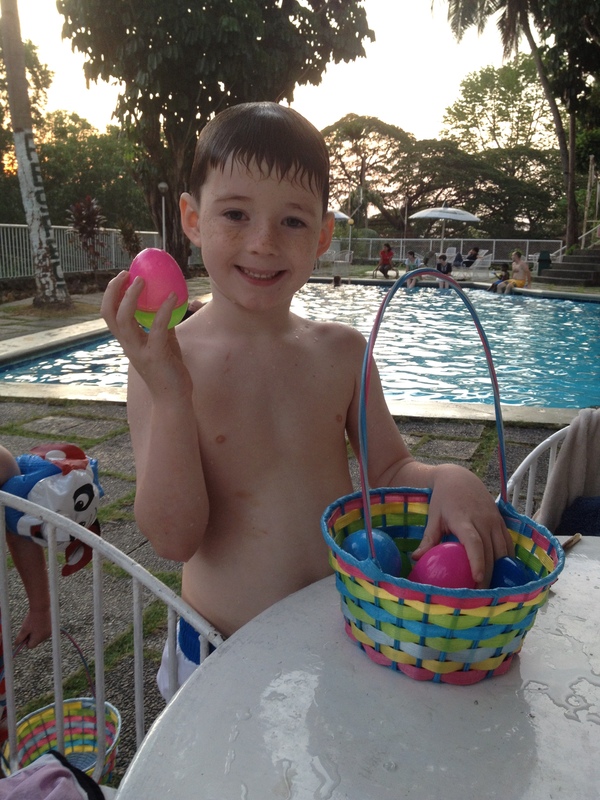 Caleb just kept collecting the same 5 eggs and then dumping them back in the pool. Then he’d collect them back up and do the same thing. 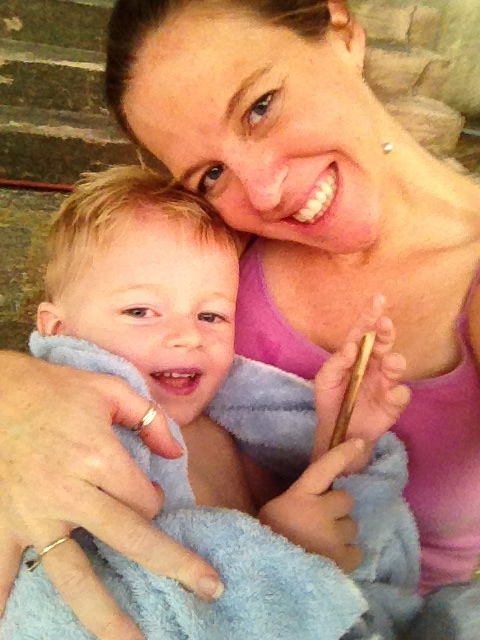 After swimming, Caleb climbed up on my lap and we snuggled. It reminded me of Mackenzie’s 7th birthday party, when I snuggled with 4-day-old Caleb in the exact same spot at the pool. Yep, purple is still my favorite! 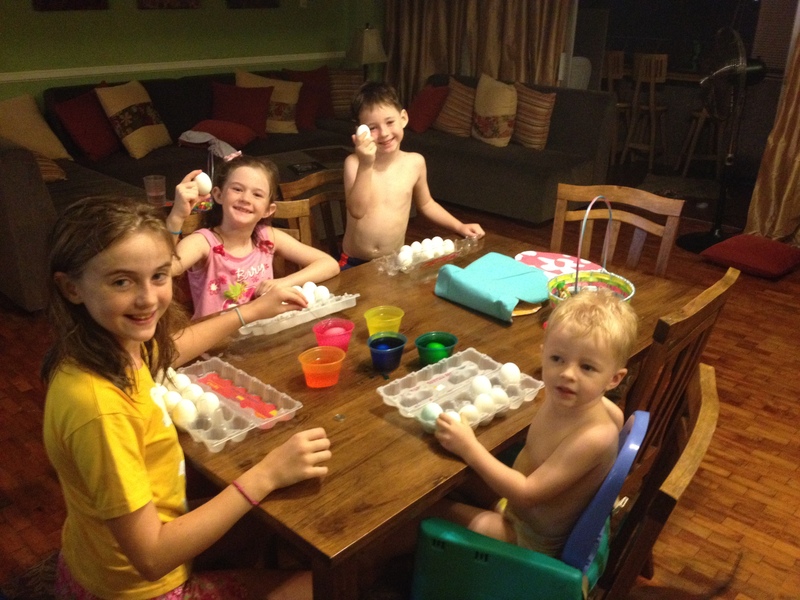 When we got back to the house, we dyed 37 eggs. Caleb was out of control! 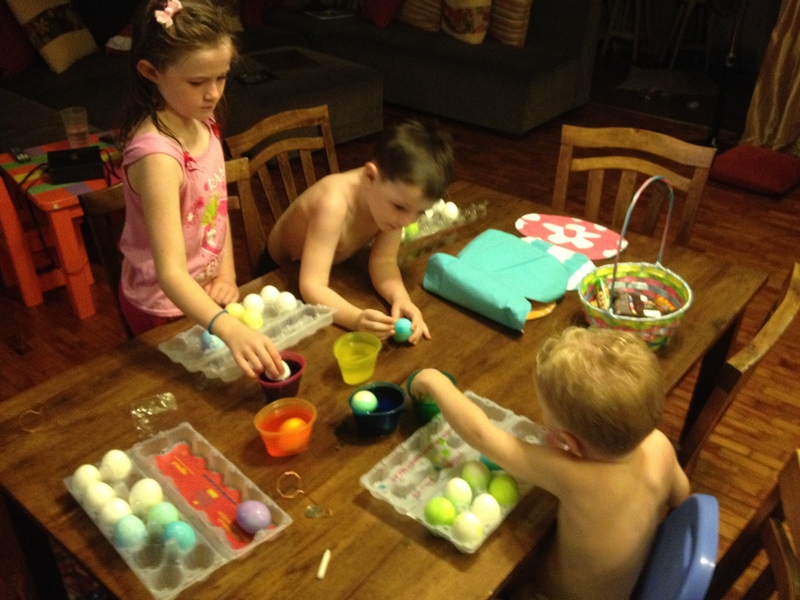 He was dunking his entire hand in the egg dye, splashing everywhere, and crushing his eggs. He had a blast, though, and now he loves that he has green “Hulk” hands. Now we eat egg salad sandwiches for the next week. 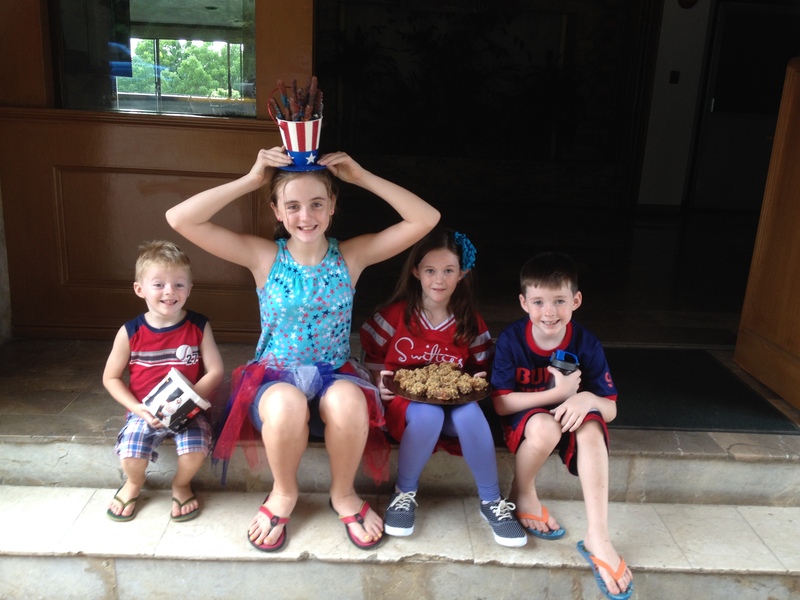 Just when we were ready to be back doing all things Filipino, it’s time to celebrate the American-ist of holidays – the 4th! It happens to also be Phil/Am Friendship day, so there is always a fun bazaar at the International School of Manila and it’s concluded with a fireworks show. Some friends of ours were all going, so we decided to join them for the fun evening. Poor Josh. We’ve been here only a week and he’s already down for the count with some kind of parasite. 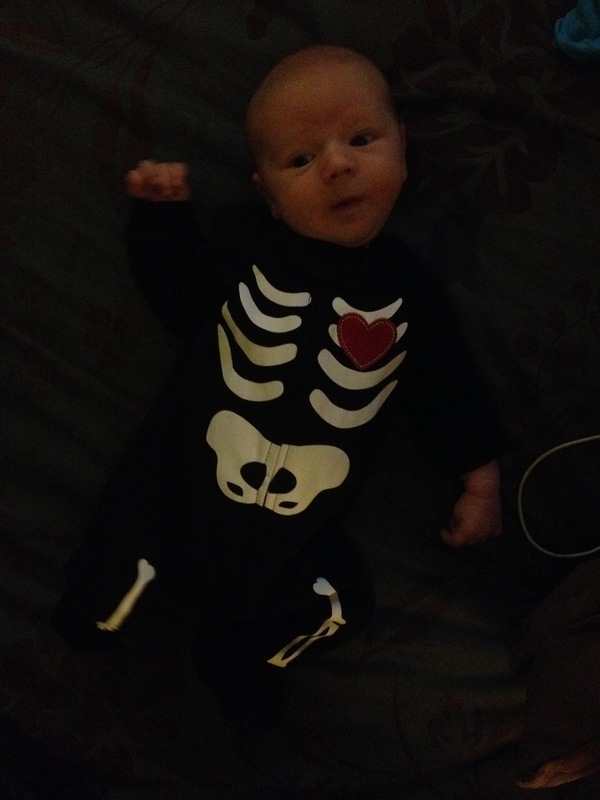 He’s on his third day of this little creature eating its way out of him. 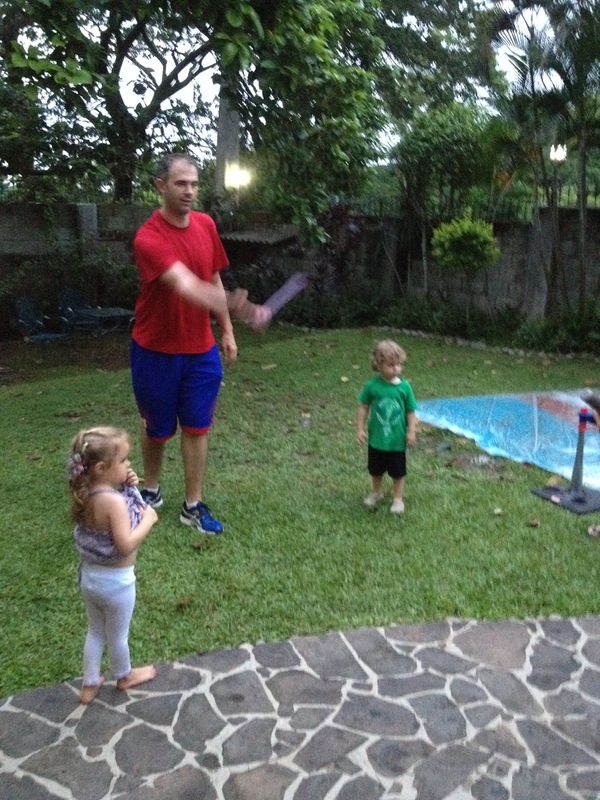 On his second night here, he went to visit his Filipino basketball team and had dinner with them. He texted me throughout the night and I don’t remember exactly what he said, but the words “horrible, squid, dysentery, and hospital” stick out in my mind. He was joking about the horrible food, but obviously he still ate it and now is paying for it. I think he’s on the mend though. 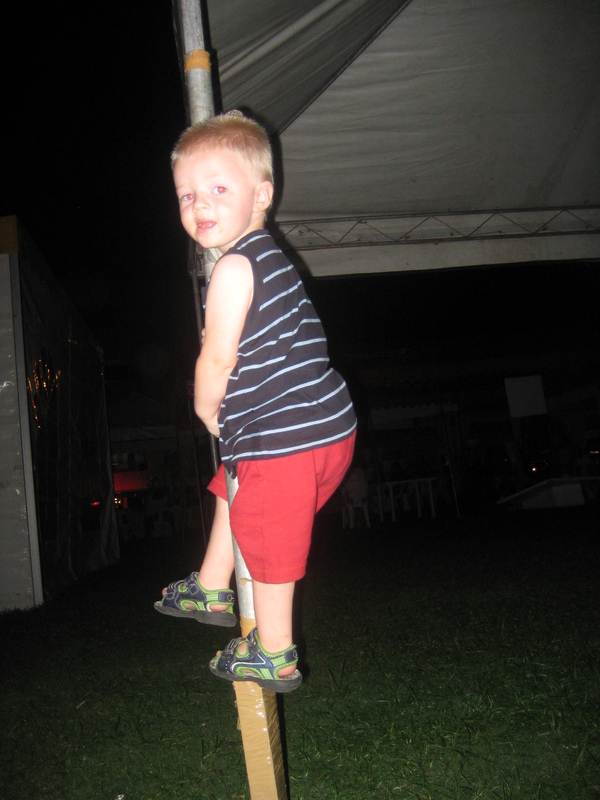 We weren’t sure if he wanted to venture out to the bazaar, but the kids really wanted to go, so he muscled up. We didn’t have any patriotic clothes, so we just opted for cute. 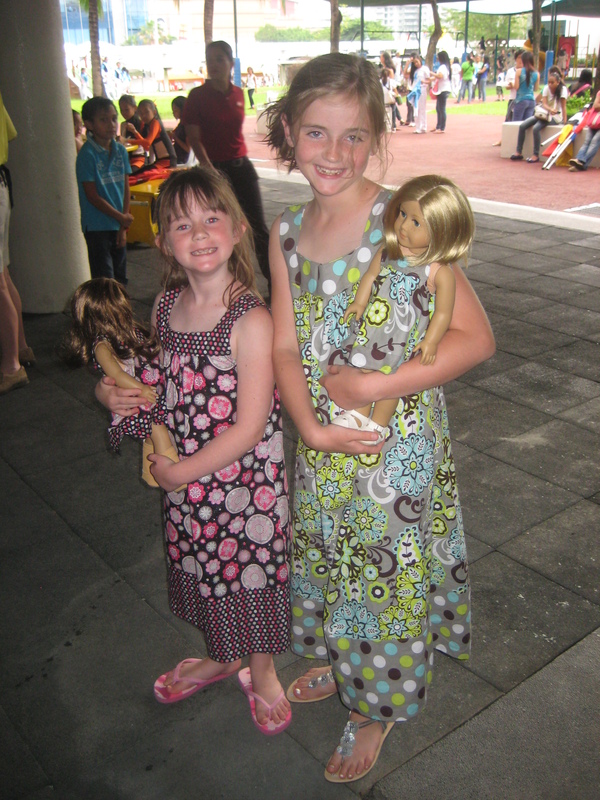 The girls wore the dresses that their Nana made, and matched their American Girl dolls in the same home-made dress. Caleb was in red and blue, so he represented our family’s patriotism. 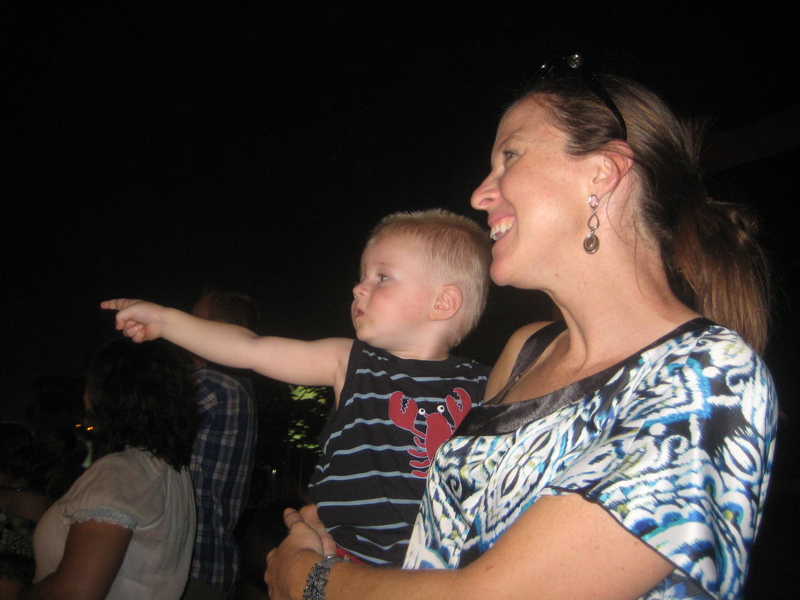 He loved the fireworks! He would jump every time one boomed, but then he’d point at them and jabber something profound. 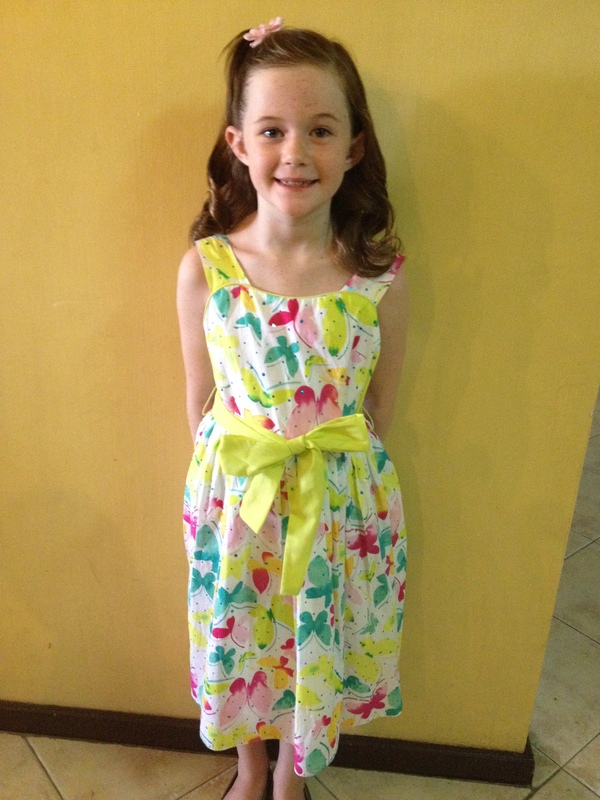 This afternoon, Mackenzie headed off to summer camp! We’re so excited for her, but not half as excited as she is. She just about jumped out of the car before I had even parked! We’re praying her through the week, starting with a protection from car sickness as her bus winds through the curvy roads up to camp. 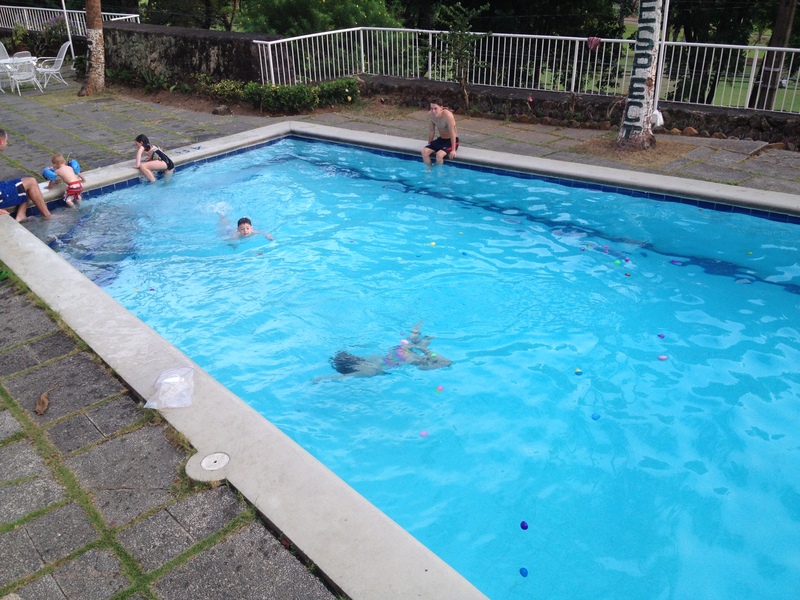 Do you know when Philippine Independence Day is??? 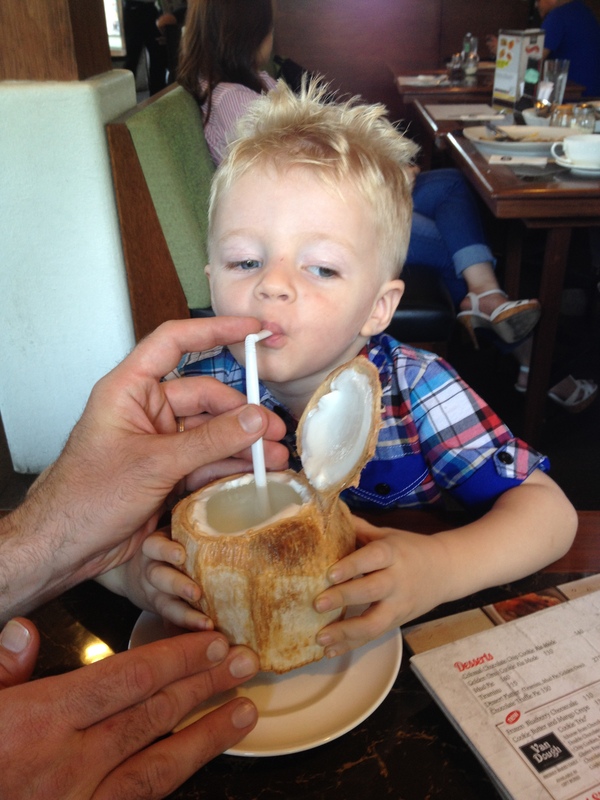 Valentine’s Day is a whole new kind of fun with kids! Josh and I decided that our Mexico trip counted as our Valentine’s celebration for the next 36 years, so it gave us the opportunity to pour all of our V-day energy into our kiddos. When we were at the Hallmark discount store last week, I picked up some decorations. After the kids went to sleep, I decorated their rooms so that they’d think they woke up in Carelot. 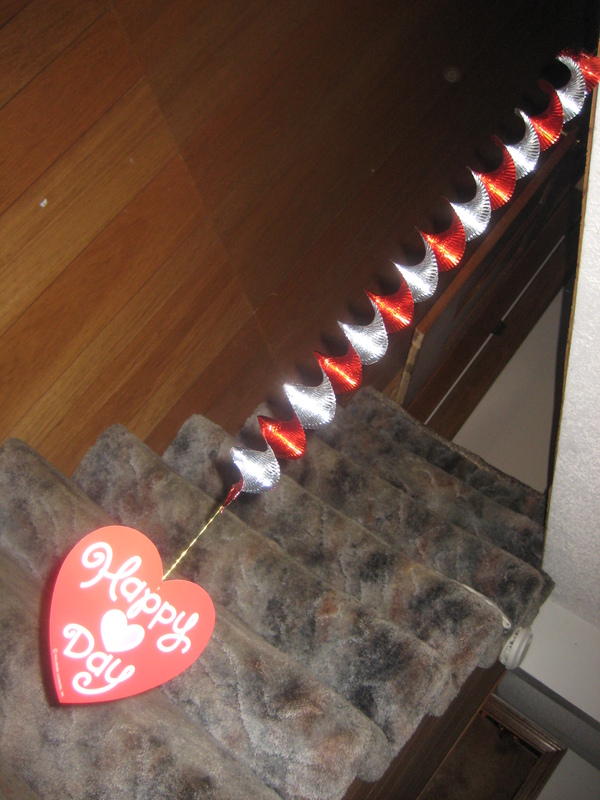 When they came out to the living room, they saw big ol’ Hershey kisses waiting for them. Their reactions were fantastic! 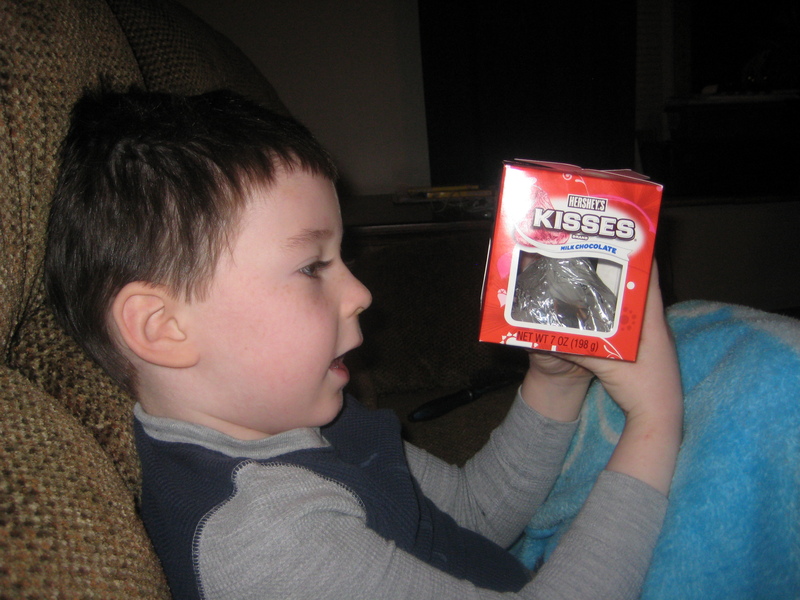 They couldn’t believe how “ginormous” their kisses were. Little Caleb didn’t get one this year, but all in good time, my boy. All in good time. Deacon went to work asking if he could eat his at 6:30am. I at least made him eat some breakfast before busting into his chocolate. 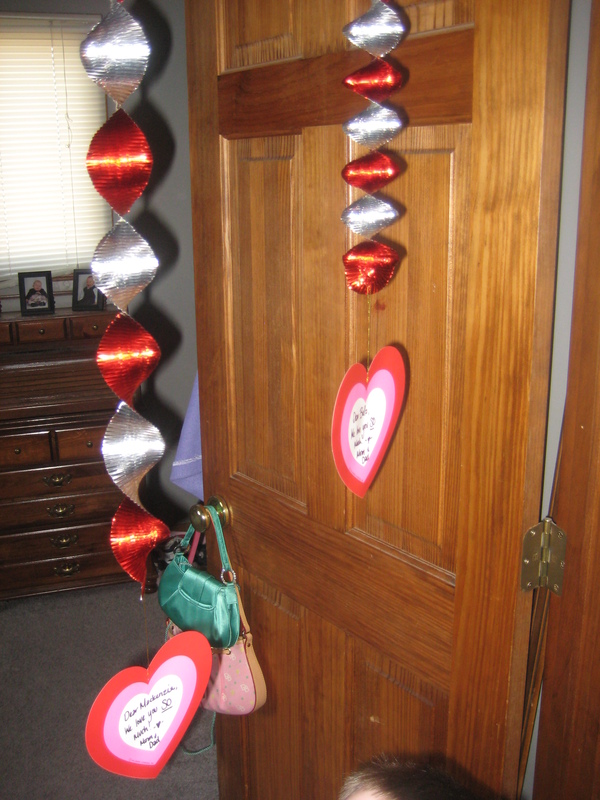 The girls left for school, so excited about their Valentine’s party. Mackenzie hand-made 24 Valentine’s for her classmates. I went ahead and bought a couple boxes of Jolly Rancher suckers that have a “T0:/From:” wrapper for Bella to sign and pass out to her friends. Meanwhile, I had a few things to pick up at Target, so the boys and I headed out for a quick shop and bite to eat (Panera for me/Chipotle for the boys). After nap, Deacon chowed on his chocolate and minutes later came to me clutching his stomach and crying, “My tummy hurts really bad.” I set him up with a movie and a blanket and realized that junk food-induced tummy aches really DO exist! That’s a first for me and I’m pretty proud of my tolerance. For dinner, we decided to join the rest of the United States in getting a heart-shaped Papa Murphy’s pizza. Josh had to wait in an out-the-door line to get the pizza and was told that V-day is their busiest day. Who knew? 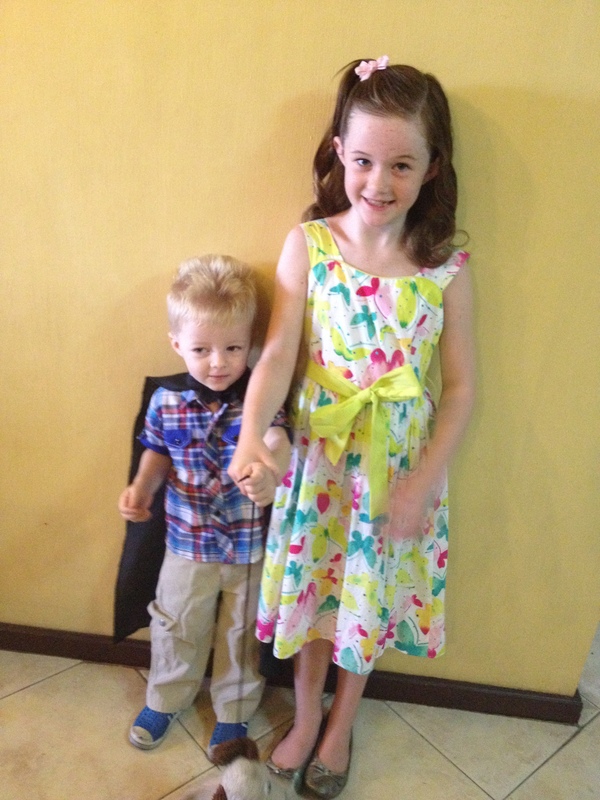 The girls and I had to grab our pizza and head out the door for our date night at Nana’s Valentine’s Day concert. 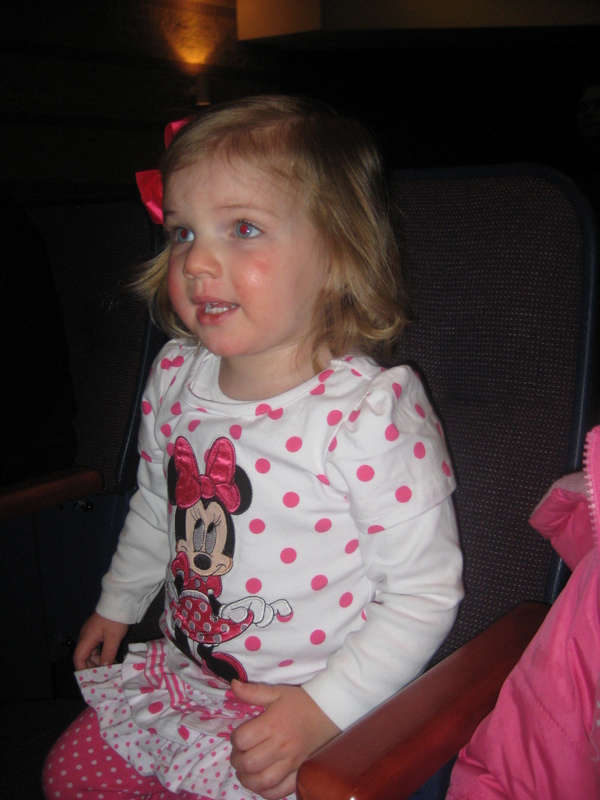 We met Grammy, Katie and her girls for a fun girls date at the high school concert. 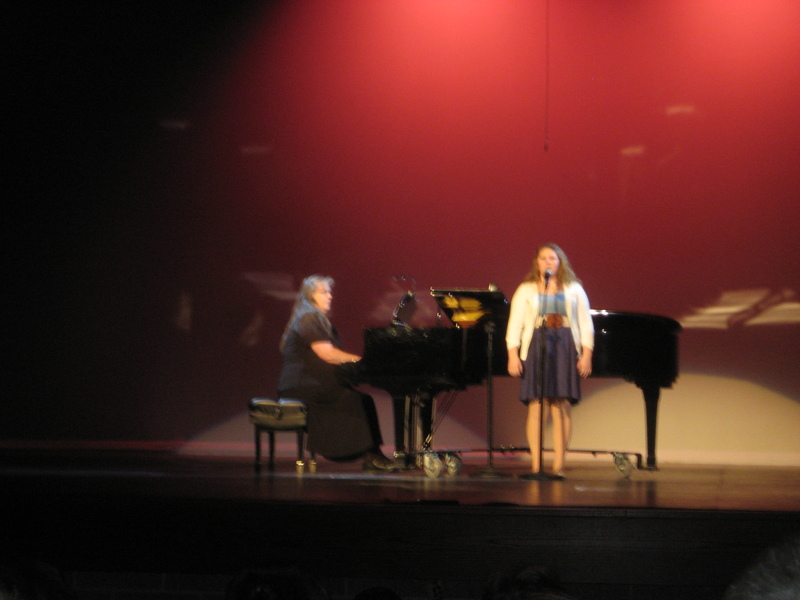 The students did all kinds of fun love songs, pop, classical, Broadway, etc. The girls favorites were the ones with pretty gowns or lots of choreography. The granddaughters all got so excited when they saw Nana on stage! One of the students even did the “cup” song from Pitch Perfect. I thought she was amazing! At intermission, there was an endless assortment of desserts, including a chocolate fountain. There were brownies, cupcakes, cake pops, and more, but I preferred the plain Hershey bars that I swiped with pick-pocket finesse. 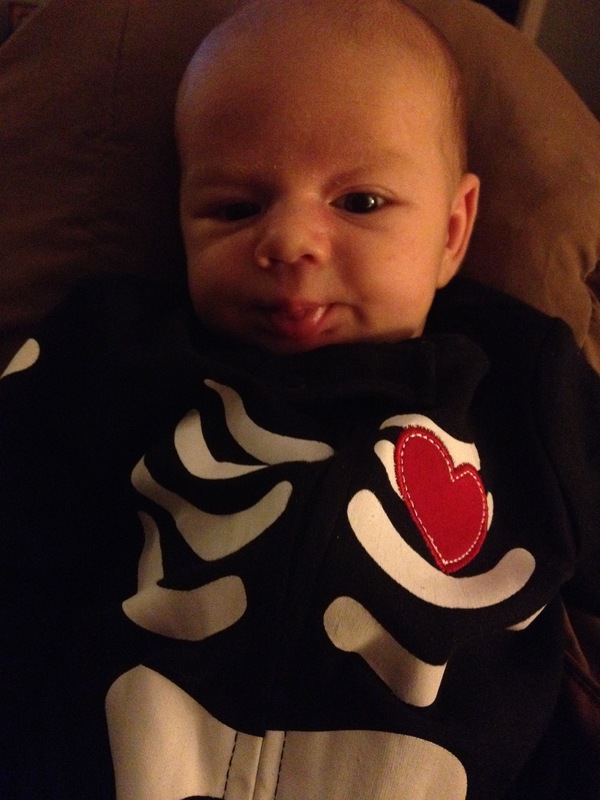 Don’t get me wrong, it was all free, but handfuls of candy look better on a kid than a 30+ year old, you know? Anyway, it was such a fun day! Now we need to score some high-grade insulin. 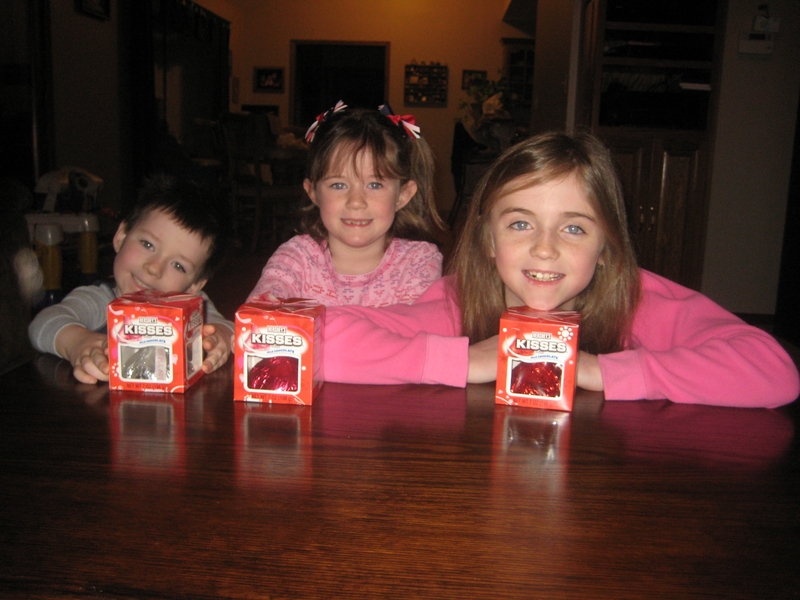 What is your favorite Valentine’s candy?? ?